The Department of Energy (DOE) issued a final rule for strong new efficiency standards today that will take a big bite out of the energy consumption of the refrigerators and freezers used in supermarkets, convenience stores, restaurants, and commercial kitchens. The significant reductions in energy use that we’ll see with the new standards are made possible by the availability of technologies including LED lighting and occupancy sensors, high-performance glass doors, and high-efficiency motors, which all provide big efficiency gains. DOE estimates that commercial refrigerators and freezers meeting the new standards sold over thirty years will reduce U.S. electricity consumption by about 340 billion kilowatt-hours and save businesses $12 billion. The new standards will also reduce CO2 emissions by 142 million metric tons, which is equivalent to the annual emissions of 30 million cars. The first national standards for commercial refrigeration equipment were enacted as part of the Energy Policy Act of 2005 (EPAct 2005) and were based on earlier state standards adopted by California and eight other states. These initial standards applied to “reach-in” refrigerators and freezers, which are typically used in food-service establishments. In 2009, DOE completed a final rule which set the first standards for equipment not covered by EPAct 2005, namely refrigerated display cases commonly used in supermarkets. The new standards issued today will achieve large cost-effective energy savings compared to products meeting the initial standards. The new standards will reduce energy consumption by more than 40% for solid-door “reach-in” refrigerators and freezers, and by 28% and 12% for glass-door supermarket refrigerator and freezer cases, respectively. 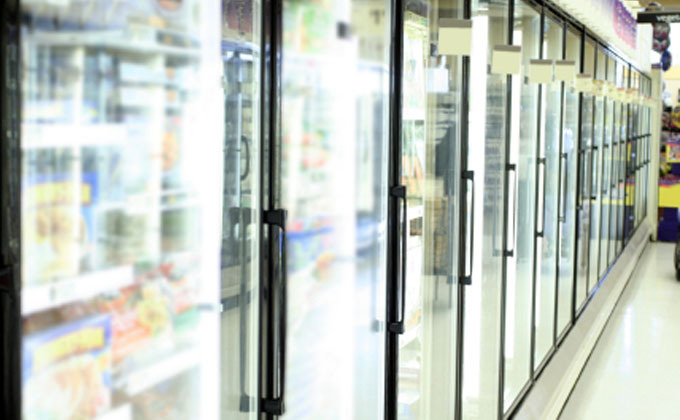 For several types of commercial refrigerators and freezers, higher efficiency levels than those in today’s rule would be cost-effective for purchasers and would achieve additional energy savings. However, the standard levels adopted by DOE capture the vast majority of the cost-effective energy savings. Both the current standards and the new standards issued today include separate efficiency levels for open and glass-door cases. 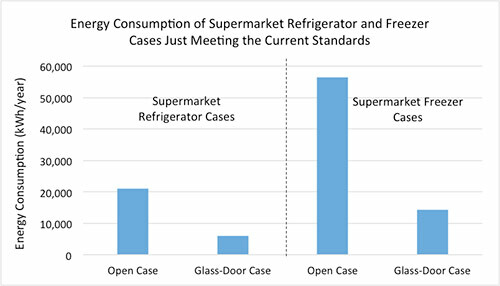 For the new standards, DOE did not analyze the potential energy savings from installing glass doors on open refrigerated cases. While some supermarkets have started to replace open cases with glass-door cases, roughly 50% of display cases in a typical supermarket are still open cases. Open cases often make supermarket aisles uncomfortable for customers and do not preserve food as well as closed cases, in addition to wasting a significant amount of energy. As shown in the graph below, typical supermarket refrigerator and freezer cases without doors sold today use 3 to 4 times as much energy as cases with glass doors. *Vertical, remote-condensing cases with a total display area (TDA) of 65 sq. ft. Replacing open cases with glass-door cases and retrofitting open cases in stores to add doors represents a significant energy savings opportunity beyond the savings that will be achieved by today’s rule. It’s good to see that DOE is starting to catch up on overdue standards. (The statutory deadline for the final rule for commercial refrigeration equipment was January 1, 2013.) Back in August, DOE sent a letter to New York State’s attorney general and others committing to a schedule for completing four overdue rules, including the rule for commercial refrigeration equipment. DOE issued a final rule for metal halide light fixtures in January, and the remaining two rules—for walk-in coolers and electric motors—are due in April and May, respectively. These four rules will make an important contribution to meeting President Obama’s goal of reducing CO2 emissions by 3 billion metric tons by 2030 through efficiency standards. ASAP recently launched a “ tracker” to monitor progress towards meeting the CO2 reduction goal and to track the total savings for consumers and businesses as a result of these new efficiency standards. Not counting today’s rule, efficiency standards adopted during the Obama administration will reduce CO2 emissions by 1.8 billion metric tons by 2030 and will net consumers and businesses $370 billion in savings . The new standards for commercial refrigeration equipment will take effect in 2017.